Following efforts over many months, culminating in a meeting with council staff, last year we managed to persuade the Council to make some concessions to the plans for Shared Parking Bays in Bedford Park. The Council confirmed that it would introduce our suggested limit of a 4-hour maximum period in the key sections of roads closest to Turnham Green station. We made strong pleas to exclude certain roads, which are already over parked, and supported our case with photographs wherever possible. However, the council staff were unconvinced and until the discrepancy between their analysis and ours can be reconciled, and problems are reported, these roads will remain in the scheme. The Council promised a review of the scheme after six months and everyone was encouraged to report any problems before the deadline. We reiterated the arguments against providing cheap-all day parking close to Turnham Green station and the inconsistency of the proposed tariff compared to the Hounslow part of Bedford Park. 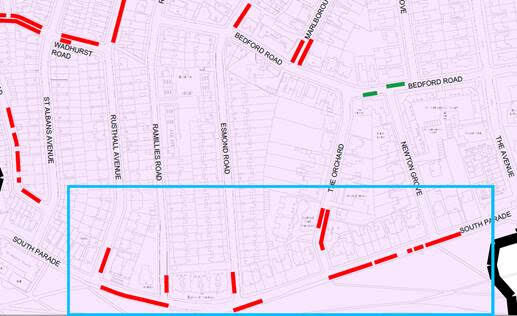 Although we requested that a 4-hour limit should be applied to all the roads in Bedford Park to control the usage, we are hopeful that the Council’s compromise to apply the limit to the sections of the roads closest to the station (shown in the map below) will make a difference in controlling the use of the bays. Interestingly, the Council actually stated that they do not expect the shared bays to be used much, especially the ones further away from the station/shops! The Council has said it is prepared to review the extent of the 4-hour limit if we can provide evidence of problems for residents. Please continue to provide any photographs of the specific parking problems in individual roads to try to convince the Council to reconsider their exemption from the scheme. Please take photographs of full bays during the daytime if you see problems and submit them to singhto@ealing.gov.uk (Tony Singh, Service Manager) and kestlaa@ealing.gov.uk (Anthony Kestla, Senior Engineer), copying us: information@bedfordpark.org.uk . We also mentioned the lack of enforcement in the area resulting in misuse of bays, and you may see more parking officers. We highlighted bays that were felt to be unsuitable for shared use due to current residents’ requirements, access or safety issues in a number of the designated roads. Unfortunately, the Council stated that it was too late to accommodate any changes in time for the live date but agreed to give these spaces particular attention and look to address possible changes ahead of the intended 6-month review, if necessary. The scheme was implemented during September. We are continuing to monitor it and would ask you to help provide any evidence of problems (including photographs) so that the Council is aware of changes that may need to be made. Send your evidence to: singhto@ealing.gov.uk (Tony Singh, Service Manager) and kestlaa@ealing.gov.uk (Anthony Kestla, Senior Engineer), copying us: information@bedfordpark.org.uk . Ealing Council proposed changes for 20 roads in Bedford Park designated as exclusively residents’ parking to be re-designated so that certain spaces would be shared with RingGo parking. It appeared that this change would be restricted to spaces by “flank walls only” rather than outside residents’ homes. These designated spaces would be shared both by residents holding parking permits and other motorists who purchase RingGo parking by telephone and would apply Monday to Friday 9.0am – 6.00pm Monday to Friday, thus providing all-day parking for £4.50. There was an unprecedented level of objections from residents during the consultation complaining about increased traffic/congestion from commuters taking advantage of cheap all-day parking; increased pollution and worse air quality; safety risks especially around schools; inadequate analysis of the existing pressure on parking and lack of appropriate consultation and dialogue with residents. Despite this, the Council decided to go ahead with the scheme and the only concession so far involves the 4-hour limit to selected bays close to Turnham Green station. The Bedford Park roads affected are: Bayham, Bedford, Blandford, Cunnington, Eridge, Esmond, Evelyn, Fielding, Kingscote, Marlborough Crescent, Priory Road, Queen Anne’s Gardens, Ramillies, Rusthall, South Parade, Speldhurst, The Avenue, The Orchard, Vanbrugh and Wadhurst. The Bedford Park Society obtained details of the Council’s proposals where you can find the original plans for each road listed in Schedule 1, and the original document with drawings showing the location of the parking spaces by road, alphabetically. We’ve continued to question Ealing Council’s withdrawal of paper visitor vouchers, which leaves Pay by Phone as the only option for payment. Our recent members’ survey showed that while residents are generally happy to have access to Pay by Phone as an alternative to the vouchers, the complete withdrawal of vouchers is impractical for many. There is no mention of this concession on the council website and local organisations such as Age UK Ealing were also unaware of it until alerted by us. Please feel free to pass this information on to any neighbours you think might find it helpful. We will keep you updated on developments and would welcome any comments from residents who may have concerns. Following complaints from residents about the introduction of cashless parking for using Pay and Display bays in Hounslow, the Society reviewed the Equalities Impact Report from the Council, which did not appear to be sufficiently detailed about the effects on the vulnerable and elderly. We also requested further details from the Council. The Society responded to the Council’s consultation on proposed charges for electric and diesel cars and household with more than one car suggesting that instead of the tariffs proposed, the Council should follow the TfL guidelines. The Society has been concerned for some time about road safety issues around the two mini roundabouts at the junctions of The Avenue, South Parade and Bath Road caused by parking between the two mini roundabouts and close to the central pedestrian islands in Bath Road. Hounslow Council implemented double yellow lines in those places, which we hope will be effective although residents are reporting continuing problems. We are also aware that there are insufficient loading and unloading bays near to the businesses in Turnham Green Terrace, and insufficient spaces for taxis and have followed up options with the Council to try to improve the situation.